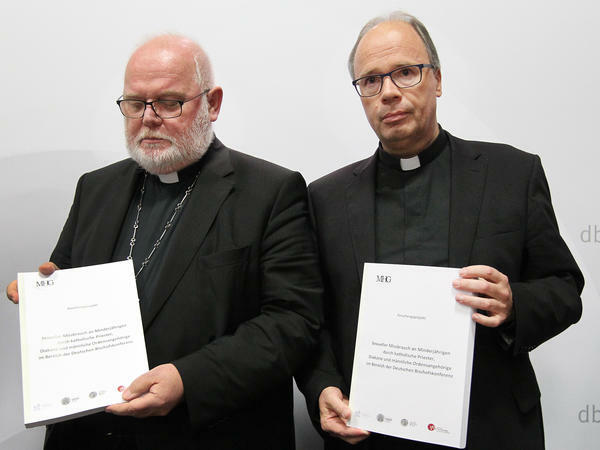 Cardinal Reinhard Marx and Bishop Stephan Ackermann present the results of the study on sexual abuse of minors by Germany's Catholic priests and clerics on Tuesday in Fulda, Germany. It found documentation of abuse of 3,677 minors by 1,670 clerics — 4.4 percent of all clerics whose personnel records were reviewed. Among diocesan priests, that figure was 5.1 percent. The report was commissioned by the German Bishops Conference and was carried out by a research consortium of universities in Giessen, Heidelberg and Mannheim. But the universities did not have access to the church's original files; instead, staff from the dioceses (or their lawyers) would review church archives and computer files, and then fill out questionnaires that were subsequently sent back to the consortium. The report noted that some records relevant to the research had been destroyed or manipulated. The study's aim was to determine the frequency of sexual abuse of minors by Germany's diocesan priests (such as parish priests), deacons, and priests within religious orders for which the bishops' conference is responsible — and to see which structures of the church might have played a role in that abuse. The report found that more than half of those abused were 13 or younger when the abuse first occurred. Abuse generally took the form of multiple occurrences against the same child or juvenile, rather than one-time incidents, with an average duration of abuse lasting more than 15 months. Boys were 62.8 percent of the victims. The study notes that the predominance of males among those abused "contrasts with the sexual abuse of minors occurring in non-church contexts." Clerics who were accused of abuse were generally between 30 and 50 when their first offenses were allegedly committed, with an average period of 14 years between when they were ordained and when their first offense allegedly occurred. Diocesan priests were transferred between parishes more often than those who weren't accused, and in most cases the receiving parishes were not informed of the allegations. The report said there was no indication that the church's abuse problem had been resolved and overcome. "Interviews with [clerics accused of abuse] also often showed tendencies to externalise or even deny personal responsibility and guilt, whilst feelings of remorse were far and few between," the authors noted. Cardinal Reinhard Marx, the president of the bishops conference, spoke at a news conference about the report on Tuesday. In an English translation of his prepared remarks, Marx said the study "makes it clear to us that the Catholic Church has by no means overcome the issue of dealing with the sexual abuse of minors." "For too long abuse has been denied and hushed up in the church," he said. "One simply looked away. I apologize for all failure and for all pain and suffering. I am ashamed because of the trust that has been destroyed; because of the crimes that have been committed by officials of the Church; and I feel shame, because many people have looked the other way and did not want to see what had happened and who did not care about the victims. This also applies to me. We have not listened to the victims. All this must not remain without consequences! Those affected are entitled to justice." The study identified several structures and dynamics within the church that might contribute to abuse, including the requirement of celibacy for priests and the church's rejection of homosexual relationships or practices. One finding was that compared with diocesan priests, a significantly lower share of deacons was accused of sexual abuse. The report cites a key difference between the groups: Deacons don't commit to celibacy. The authors write that "though the obligation to observe celibacy certainly cannot explain the sexual abuse of minors by itself ... the question should be addressed as to the extent to which celibacy may be a potential risk factor for sexual abuse for specific groups of individuals." The study also found that seminaries spend very little time addressing sexuality and the development of one's sexual identity. The authors deem this curriculum "inadequate" for priests in training who are signing up for a life of celibacy. "Official attitudes and statements made by the Catholic Church, such as that celibacy is a 'gift' to priests, do not take sufficient account of biological and psychosocial needs for commitment," the authors write. "It is possible to have a mature and voluntarily chosen celibate form of life. All candidates for the priesthood do not necessarily satisfy the basic preconditions of voluntariness and mature personal development, however." As NPR's Esme Nicholson reports from Berlin, some bishops in Germany are now suggesting perhaps priests should be allowed to marry. German Justice Minister Katarina Barley said the study was "shocking and probably just the tip of the iceberg," AFP reported, and she demanded that the church "take responsibility for decades of concealment, cover-ups and denials." Speaking in Estonia on Tuesday, Pope Francis acknowledged that the sexual abuse scandal had driven many people away from the church. The report's authors identified the church's essential structure as one major cause of abuse, noting that its "hierarchical-authoritarian system" can lead priests to adopt an attitude of dominating non-ordained individuals and then also cause church leaders to protect an accused person by covering up events, rather than focusing on the danger to children. "Sexual abuse is above all also an abuse of power," they wrote.